Listen up, Downton Abbey fans -- or really any fan of British historical fiction. 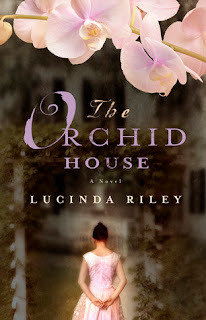 The Orchid House may be for you. The parallels to the PBS hit series are certainly what sucked me in. Old estate, big family with lots of heirs and plenty of secrets. After finishing, I don't know that I can put it quite on par with the writing and characters at Downton, but it's certainly similar enough to keep you interested. Plot: Julia is struggling with grief after the sudden loss of her husband and son, so she leaves her home in France and heads to a small cottage in the English countryside where she grew up. She soon meets Kit Crawford who owns Wharton Park, an old estate that once thrived but is now crumbling and up for auction. Amid the relics on the old estate, Kit finds a diary belonging to Julia's grandfather. The diary leads Julia to seek out her grandmother to learn the history of her family, and ultimately Wharton Park as a whole. The novel alternates between present-day England and WWII England, where the men of Wharton Park are soon off to fight in Southeast Asia. The stories intertwine with themes of love, loss, and secrets long held. I liked the plot well enough, though it was a slow start for me. There were also a few twists that caught me off guard, but an equal amount that were fairly predictable. Characters: Julia and Kit form the backbone of the story, with Julia's grandmother Elsie leading them into the past. Julia was likeable enough, and her grandmother proved to be a worthy storyteller. Alternating story lines between present and past kept me interested in all of the characters and their respective arcs. Kit had potential, but some of his dialogue was just a bit too over the top. Too formal, yet also erring on the cheesy side.